Erbil, Kurdistan Region, Iraq (cabinet.gov.krd) – Kurdistan Regional Government Spokesperson stated that his government condemns, in strongest terms, last night’s terrorist attack at Istanbul’s Ataturk Airport that killed dozens of civilians. In a statement to KRG’s website, Safeen Dizayee expressed his condolences to the government and people of Turkey and wished a speedy recovery to those injured in the attack. He said that Kurdistan Regional Government and the people of Kurdistan Region are in the forefront in the fight against terror and have suffered greatly from terrorism. Mr. Dizayee said Istanbul attack is another reminder that terrorism is a global threat and we need to remain steadfast in our efforts to confront the threat of terror in the region and around the world. Saint Petersburg, Russian Federation (cabinet.gov.krd) – On the sidelines of the SPIEF’16 – St. Petersburg International Economic Forum, Kurdistan Region Prime Minister Nechirvan Barzani and his delegation met Mr. Alexander Novak, Russian Minister of Energy. Minister Novka welcomed the participation of Prime Minister Barzani and his delegation at St. Petersburg International Economic Forum, stressing the need to further develop the old relations between the two sides. He pointed out that the energy sector in Kurdistan Region could be further developed and that Russia wishes that its energy companies contribute to this development. Prime Minister Barzani thanked Mr. Novka for the warm reception and highlighted the historical ties between the two sides, which he said can be developed in various fields. He explained the situation in Kurdistan Region, its current financial crisis, the war against ISIS and the issue of accommodating a large number of refugees and displaced persons, who fled ISIS repression and took refuge in Kurdistan Region. He thanked the Russian government for its support and assistance for the Kurdistan Region in its fight against terrorism. Prime Minister Barzani offered his government’s support to Russian companies that invest in energy and other sectors in the Kurdistan Region. He said that despite the situation in the Kurdistan Region, Gazprom Naft continues its operations and that his government will provide the needed facilities in order to expand its activities in the Region. In an earlier meeting with Prime Minister Barzani, Gazprom Neft Board Chairman Alexander Dyukov expressed desire to expand their activities in the Kurdistan Region. Saint Petersburg, Russian Federation (cabinet.gov.krd) – Prime Minister Nechirvan Barzani and his delegation met Russian Foreign Minister Sergey Lavrov on the sidelines of the SPIEF’16 – St. Petersburg International Economic Forum. Welcoming Prime Minister Barzani, Foreign Minister Lavrov highlighted Russia’s good relations with the Kurdistan Region including the active roles of the Consulate General of the Russian Federation in Erbil and Russian commercial enterprises, particularly in the field of energy. Talking about Russian support to the Kurdistan Region in its war against ISIS, Mr. Lavrov reaffirmed that his country will continue its support. Prime Minister Barzani thanked Minister Lavrov for the warm welcome and highlighted the old friendship between the people and governments of the Kurdistan Region and the Russian Federation. He also expressed his gratitude for the Russian military support to the Kurdistan Region in its war against ISIS terrorists. Prime Minister Barzani also praised the work of Gazprom Naft in the Kurdistan Region, and the role of the Russian Consulate General in Erbil. He expressed his wishes to develop relations in various fields. They also discussed the situation of the Syrian refugees and Iraqi internally displaced people who fled ISIS and took refuge in the Kurdistan Region. Mr. Lavrov praised the role of the people and government of the Kurdistan Region for the assistance they have offered to this large number of vulnerable people. The Kurdistan Regional Government strongly condemns the attack in the city of Orlando in the United States of America that claimed the innocent lives of 49 civilians and injured more than 50 others. We express our heartfelt condolences and deep sorrow to the families and friends of the victims and to the people and Government of the United States of America, wishing a speedy and complete recovery for the wounded. This heinous crime is another reminder that terrorism is a serious threat to humanity. Therefore, cooperation in the fight against terrorism should be intensified and anti-terror front strengthened. I am pleased and privileged to be part of this important celebration, which is the 240th anniversary of the signing of the Declaration of Independence of the United States of America. Please allow me, Mr. President, on behalf of the people and government of Kurdistan to congratulate the people and government of the United States on this significant day in the history of the US. On this special occasion, we celebrate the birth of America as a free and independent nation. Independence Day is not only a day that Americans celebrate, but also other people around the world celebrate freedom, liberty and democracy. The US is a global leader and we are proud of the relationship that has developed between our peoples and governments. Today, on this important occasion, I would like to reiterate our commitment to a long term strategic partnership with the United States of America. We, the people of Kurdistan, view the United States as a true friend and ally and we hope to see our ties develop into a strong strategic partnership. We still remember the days when we were suffering from the oppression by the former regime. It was 25 years ago, when the United States came in to help by establishing the safe haven and imposing the no-fly zone above the 36th parallel line to ensure our safety. That marked the foundation of our long-term partnership with the US. Again in 2003, we entered another stage when we worked together to liberate Iraq from tyranny and dictatorship. A decade later, after the emergence of Da’esh in 2014, the US once again came in to provide much-needed assistance and support to help Kurdistan and the rest of Iraq to fight this brutal terrorist organization. Today, the US plays a leading role in the international coalition against Da’esh. This war has been a tough, and a costly war in terms of human lives, as well as resources but the war is not over yet. We count on continued support from our friends in the international community in this regard. We also appreciate the humanitarian assistance provided to the internally displaced people and refugees in Kurdistan Region. But much more is needed to be done. In addition to the two important areas of the fight against Da’esh and the humanitarian crisis, we expect more engagement from the US in dealing with the economic crisis that we face. Having said that, we want our relations to expand and broaden with a focus on education, culture, economy, trade, business and all other areas that are pillars of strong bilateral ties. I thank the US Embassy in Baghdad and the Consulate General in Erbil for the great cooperation. I would also like to take this opportunity on behalf of the Kurdistan Regional Government to thank Ambassador Jones and Consul General Mittman for their service and dedication in Iraq and Kurdistan Region. Also, the KRG appreciates the educational opportunities, particularly the Fulbright scholarship and other human capacity building programs that are offered to all of Iraq and Kurdistan Region. The continued high-level visits from US officials to Kurdistan Region are an additional significant sign of the attention that the US places on Kurdistan and vice versa. We have been working together and we will continue to work together for the sake of stability, security and prosperity in the Region. I would like to once again emphasize that we share the same universal values and principles. Because of the strong vision of our leadership, the bravery of our Peshmerga, the resilience of our people, the support of our international Partners and our collective commitment towards a better future, we have been able to survive the worst situations. Yes, it is a challenging time, but we also see the opportunity for us to implement the reform strategy and agenda. We are optimistic about a better and more prosperous future for the people of Kurdistan. The American dream, including its road to independence, is a source of inspiration for the people of Kurdistan and many other people around the world. We look forward to the day when the people of Kurdistan can also celebrate their independence day. Thank you again and I wish you all a very happy independence day. Salahadin, Kurdistan Region of Iraq, (dfr.gov.krd)- President Masoud Barzani received a Syriac Orthodox Church delegation headed by His Holiness, Moran Mor Ignatius Aphrem II, the Patriarch of the Syriac Orthodox Church. During the meeting President Barzani and Patriarch Ignatius spoke of the collective efforts against the terrorists of the Islamic State and they stated that the terrorists have only strengthened the relations between Kurdish and Syriac peoples as that history of coexistence for thousands of years cannot be affected by any force. Patriarch Ignatius expressed his appreciation to the Kurdistan Region for the important role that has been played by the people and government of Kurdistan in providing a safe refuge to the Christian community of IDPs from Mosul and other areas which were affected by the terrorists. President Barzani reiterated his stance on the fact that the Kurdistan Region takes great pride in its ethnic and religious diversity and that this common enemy must be made aware that an attack on any group in the Region, ethnic or religious is an attack on the entirety of the Kurdistan Region. Erbil, Kurdistan Region, Iraq (cabinet.gov.krd) –Prime Minister Nechirvan Barzani yesterday received former French prime minister Mr. François Fillon accompanied by a delegation of French lawmakers and diplomats. Mr. Fillon, who visited camps of refugees and internally displaced persons as well as the battlefront against ISIS, highlighted the important role the Peshmerga forces play in the fight against terrorism. They also discussed the situation of Christians in Iraq who fled ISIS repression and took refuge in the Kurdistan Region. Prime Minister Barzani expressed his government’s gratitude for the continued French support to the Kurdistan Region. He stated that as the fight against terrorism continues, the displaced people who have fled their homes need more support from the international community. Discussing relations between Kurdistan Region, Baghdad, and neighboring countries, Prime Minister Barzani said Kurdistan has always sought to be a factor of stability with all its neighbors and to settle outstanding issues with Baghdad through dialogue. They also discussed political developments in Iraq, the Syrian crisis, and economic and financial difficulties in the Kurdistan Region. Washington DC, USA (cabinet.gov.krd) – Economic reforms and investment opportunities in the Kurdistan Region of Iraq were highlighted during a one-day conference in the United States. The conference, titled ‘Iraq’s Economy: Challenges and Opportunities’, was hosted by the Johns Hopkins University’s Center for Transatlantic Relations on Thursday, June 2. 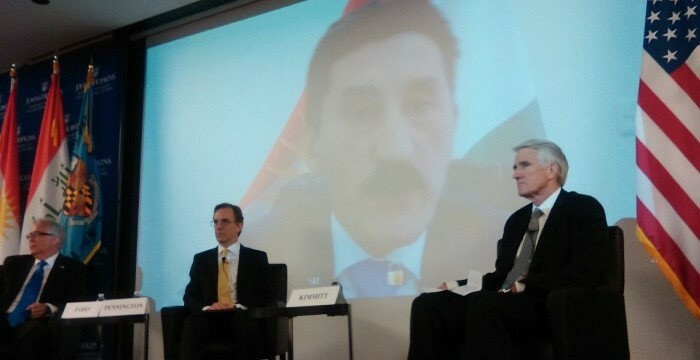 “There is a great deal to hope for in the future of Kurdistan and in all of Iraq” Kurdistan Regional Government Representative to the United States Bayan Sami Abdul Rahman said before the attendees, which included American and Kurdish business leaders, government officials, experts, and members of the media. “Decentralization is definitely the future for Kurdistan and for Iraq if we are going to have a successful economy – but it doesn’t mean abandonment”, said Representative Abdul Rahman. James Parks, KRG Senior Economic Advisor outlined some of the goals of financial reform in the Kurdistan Region, highlighting the need for Kurdistan for to grow its financial sector and economic institutions. Also speaking at the conference was Ambassador from Iraq Lukman Faily, Deputy Assistant Secretary of the US Department of State for Iraq Ambassador Joseph Pennington, Head of the Iraq National Investment Commission Sami Al-Araji, and a number of other American, Kurdish, and Iraqi business leaders, experts, and government officials. The conference is the first such event in Washington for some years and was organized with the support of the Kurdistan Regional Government Representation in Washington, the Iraqi Embassy and the office of the US Trade Representative.